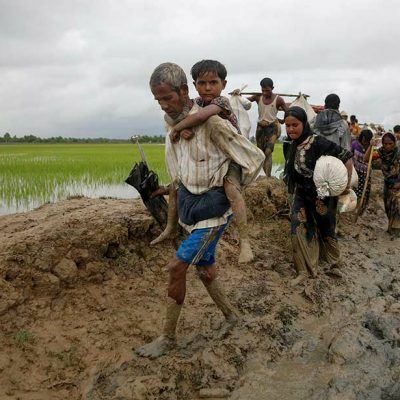 American Jewish World Service (AJWS), the leading Jewish organization supporting the human rights of ethnic minorities in Burma, has launched an emergency fund to offer immediate assistance to the Rohingya people fleeing horrific violence and mass displacement perpetrated by the Burmese military. The persecution of the Rohingya has recently intensified. Since late August, Burmese forces have burned entire Rohingya villages to the ground and indiscriminately massacred Rohingya men, women and children—forcing more than 400,000 Rohingya to flee to Bangladesh. The horrific persecution of the Rohingya people in Burma has intensified in recent weeks. Since late August, Burmese armed forces have burned entire Rohingya villages to the ground, and soldiers have indiscriminately massacred Rohingya men, women and children. More than 300,000 people have fled on foot to refugee camps in Bangladesh for fear of being imprisoned, tortured or murdered.